I've been struck down with a cold all weekend so I've spent most of it inside despite it being gloriously sunny and mild-warm in London. I'm not much of a sit in the sunshine type as I generally prefer the shade, but I do like a good walk around the city when the weather is nice. Anna Quindlen's latest novel made an excellent partner for my time slumped on the sofa with views of the bright blue sky outside. “Still Life with Bread Crumbs” is the story of Rebecca Winter, a middle-aged photographer of some renown who has fallen down on her luck. She came to fame with a series of close-up, introspective photographs she took in her home following a dinner party and fight with her husband. Since her royalty checks have dwindled and her expenses for caring for her mother beset with dementia keep rising she's had to rent out her New York City apartment and take up residency in a cheap rural house up state. Here she strikes up relationships with some of the colourful locals and starts new projects including photographing mysterious memorial crosses set in the nearby forest and a stray dog she takes ownership of. Her priorities in life shift in this new environment and her relationship to her artistic photographs alters as she makes a new home. Rebecca has divorced her husband who found her success in photography difficult to take. It's only through her artistic expression that she understands that her relationship with him really isn't working and they have diametrically opposed views on how they want their life together to progress. “Rebecca simply wasn't much of a story... She realized that marriage doesn't really make much of a story... most of it is the mundane middle part.” The heady excitement of a new relationship is easy to get caught up in, but the experience of a long, steady companionship is something quite different. Her husband simply isn't interested in the second part. When there is an imbalance in relationships like this Quindlen makes a well-observed statement about how passionate love affairs can slowly wilt: “in love no one ever leaves well enough alone, and so it settles into a strange unsatisfactory kind of friendship or sours into mutual recriminations and regret.” Likewise when Rebecca starts a new relationship with a man who helps catch a racoon that's taking up residence in her attic, the author cleverly traces the patterns of missteps and misunderstandings that occur when heightened passion supersedes straightforward honest communication. One of the things I appreciated about this novel the most is the honest way it deals with the importance of money in an individual character's life. Too often in novels it seems the financial concerns of working class people and artists are left in the background when really it is something at the forefront in people's minds when money is a day to day concern. Since Rebecca has seen a declining interest in her photographic work money has become a much greater concern for her. She constantly calculates what her remaining funds are in relation to the expenses she has going out because she is growing older and has people dependant on her. Quindlen shows how the value of money can become so easily mixed up with personal values. People must constantly weigh up the sentimental value of something against its monetary value. Herein the importance of a thing shifts depending on the financial circumstances of the individual. Over the course of the novel Rebecca develops a deeper understanding of life as a process: “The problem was that she'd thought that at a certain point she would be a finished product.” It comes as a relief when Rebecca stops trying to shape her life into something she can control and embrace what pleasure can be found in the ever-shifting present. Written in a series of short fast-paced chapters it speeds along through Rebecca's year in her remote home. 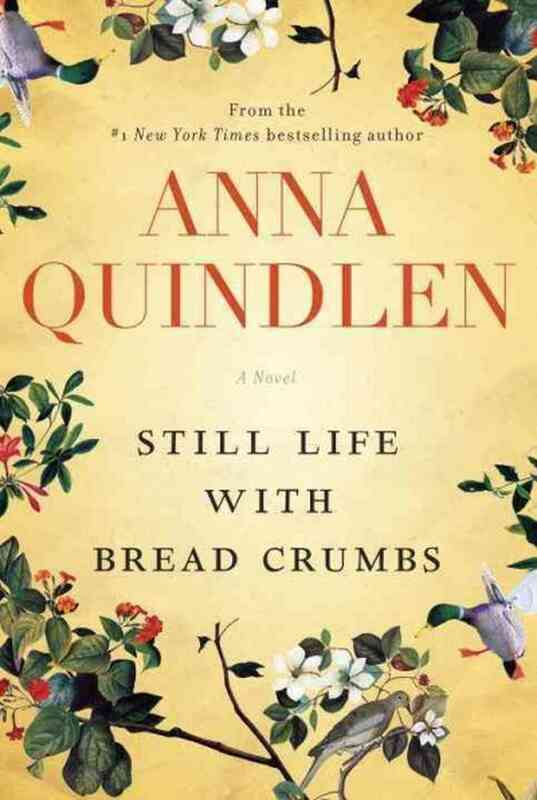 “Still Life with Bread Crumbs” is a thoroughly pleasurable warm-hearted read.